If you're a fan of Mexican food, this delicious mango salsa is surely going to make its place on your dining table. Whether you're making tacos or a starter, this salsa is always going to be a good combination. The key to making the best version of this unique salsa recipe is to delicately balance the sweetness of mango with the fiery texture of peppers. You can keep this salsa for up to two days. I love to include this salsa with Chicken Tacos and similar type of recipes. Though you can make subtle changes in the proportions of key ingredients, I'll always recommend sticking with the original quantities to get the best possible results. 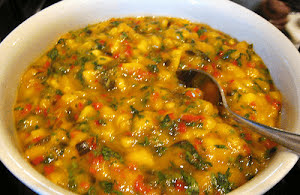 Without any delay, let's quickly make this lip-smacking mango salsa for our loved ones. Savor this fruity and peppery salsa preparation made with mango and loads of peppers which gives it a unique sweet and hot flavor to satisfy your taste buds. Take a bowl and make sure it's completely dry. Add mango pulp, diced ripe mango, finely chopped jalapeños, finely chopped red bell pepper, minced green chilies, and minced ginger to the bowl. Gently combine everything well with a wooden spatula. Now add finely chopped cilantro, lime juice, and salt to the bowl. Again, use a wooden spatula and combine all the salsa ingredients. Serve with tacos, snacks, starters, and with similar kind of preparations. You can keep this salsa for up to 2 days in a refrigerated form.